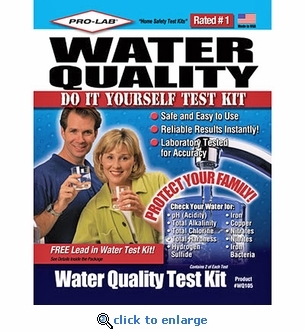 The Pro-Lab Professional Water Quality Test Kit is an affordable, easy-to-use and reliable way to check water quality at your home with accurate instant results. The Professional Water Quality Test Kit accurately monitors municipal water supplies, private well water and able to check the efficiency of home water filtration devices. It is recommended that homeowners check their water quality every 3 months when using a home filtration device. The PRO-LAB Professional Water Quality Test Kit contains eight (8) individually wrapped laboratory grade test strips, enough to perform sixteen (16) water tests, (2 for each test) in order to determine water quality. This test kit will measure for potentially major water problems such as chlorine, iron, pH, copper, alkalinity, nitrate, water hardness and more. Place the test strip under cold running water according to the directions, and compare the results against the color charts provided. Test results will indicate “danger”, “caution” or “safe” levels in as little as 1 minute.